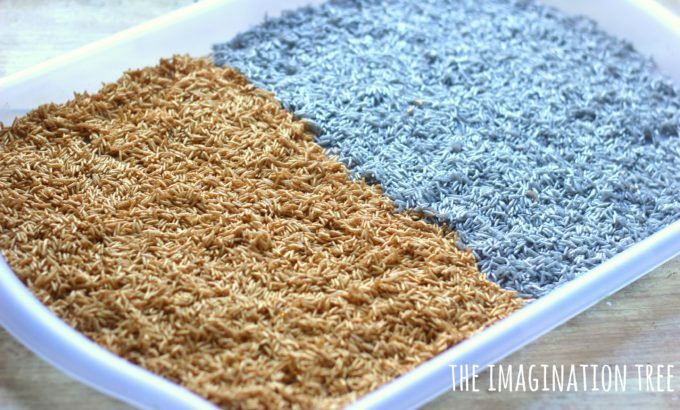 Here’s how to dye metallic rice for sensory play and creative projects! 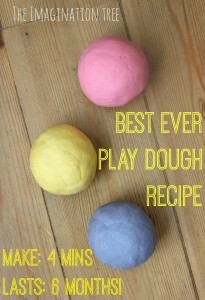 It takes just a few moments to make, requires no vinegar and lasts for years! best of all, it’s so wonderfully sparkly and magical! 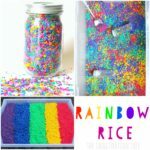 I recently wrote an easy tutorial for how to dye vibrant rainbow rice in minutes using just one added material. 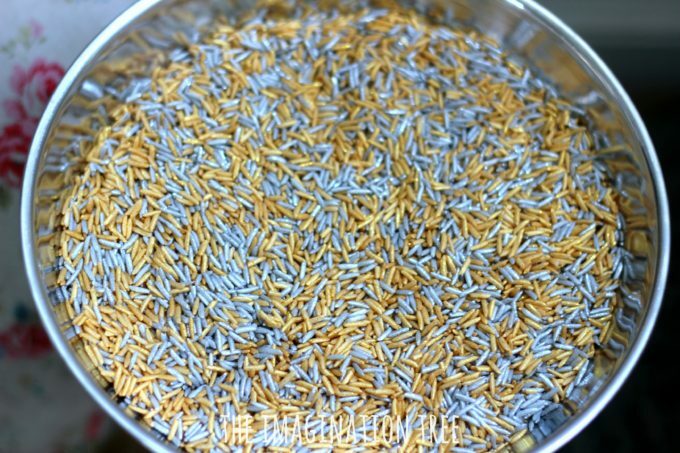 It has been super popular because many parents and educators had been using the more laborious method of adding vinegar or hand gel (which also makes the rice smell awful!) and this method is just so much simpler. My kids can make it themselves now too! 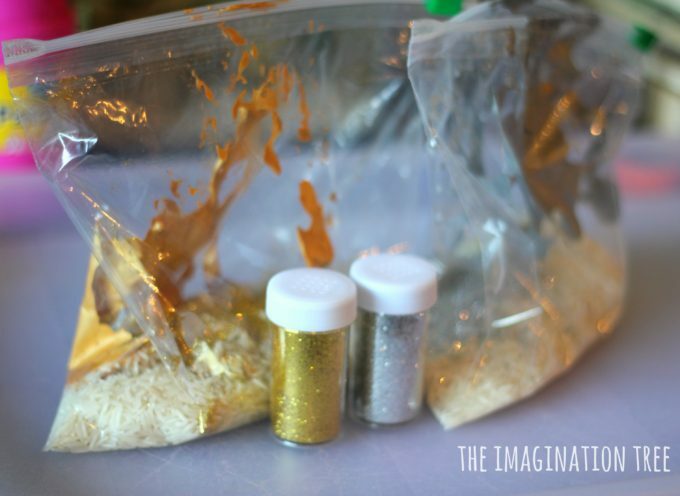 Half fill large zip loc bags with dry rice and then simply squeeze a large squirt of the metallic washable paint into the bag and then zip it shut. The next part is the most fun! 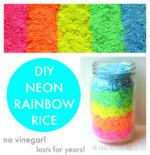 Mix the paint into the rice through the bag, squishing and shaking it until it’s fully coated. Then tip it out onto a flat surface such as a tray and sprinkle generous amounts of glitter in corresponding colours over the top. Leave it to dry for an hour or so and then it’s ready to play with! 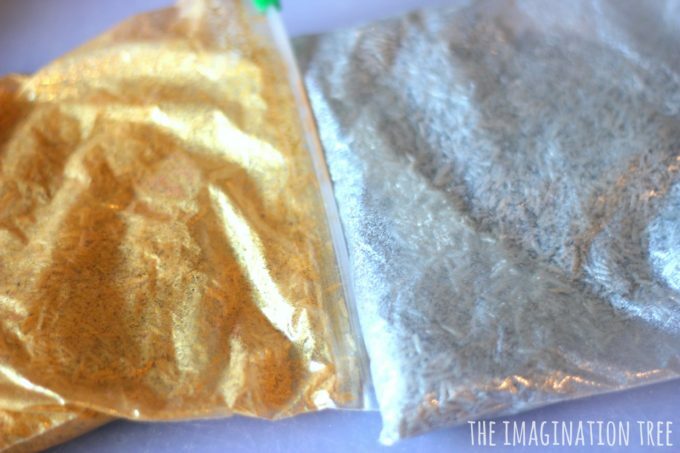 The rice really sparkles and looks amazingly metallic in silver and gold. 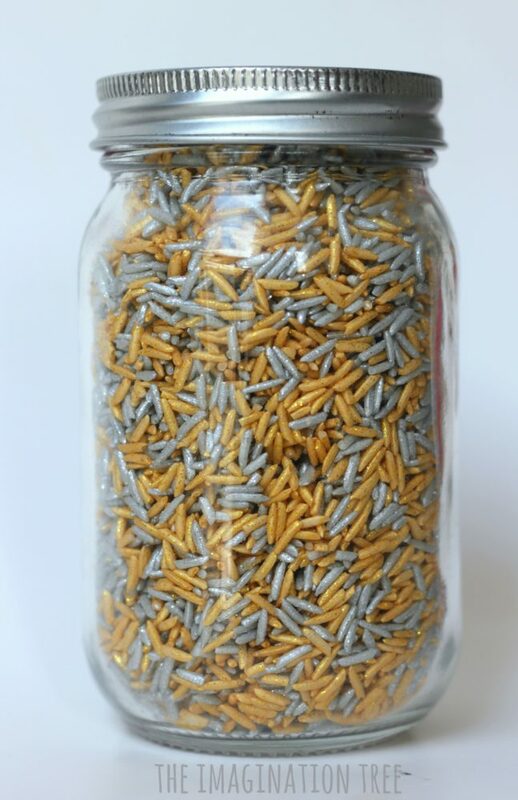 It would make a wonderful Christmas or celebration themed sensory tub filler and can also be used to make fantastic art work when sprinkled over PVA glue. 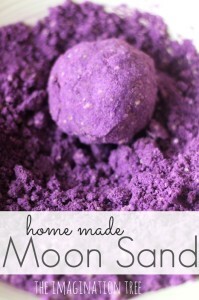 When you’ve finished playing with it then store it in a jar with a lid or a plastic container. 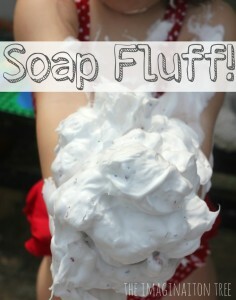 As long as it is kept dry and away from humidity it will last literally years and can be re-used over and over again. This makes it really economical and not a great waste of food. It’s cheaper and more frugal (not to mention such a great sensory experience that you simply can’t match with plastic and man-made toys) and will last for ages. 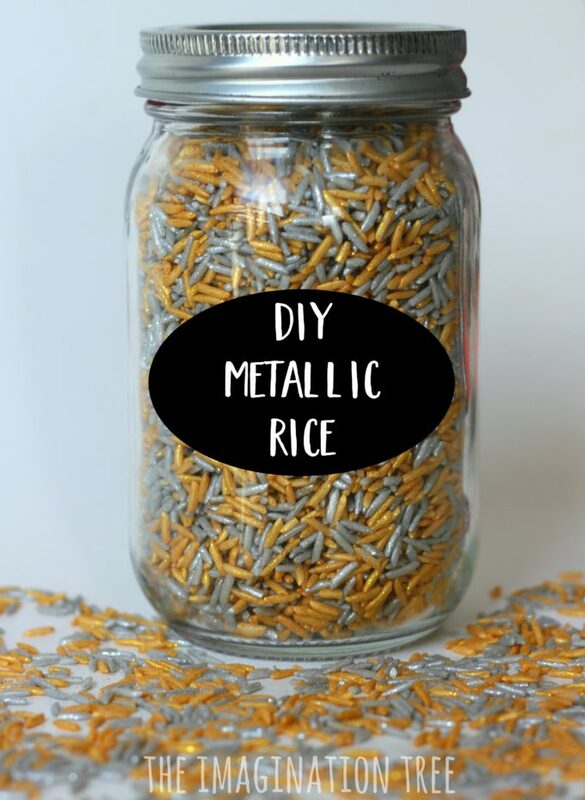 A jar of this magical metallic rice would make a great DIY gift for the kids or to sell in jars at school fair fundraiser events! 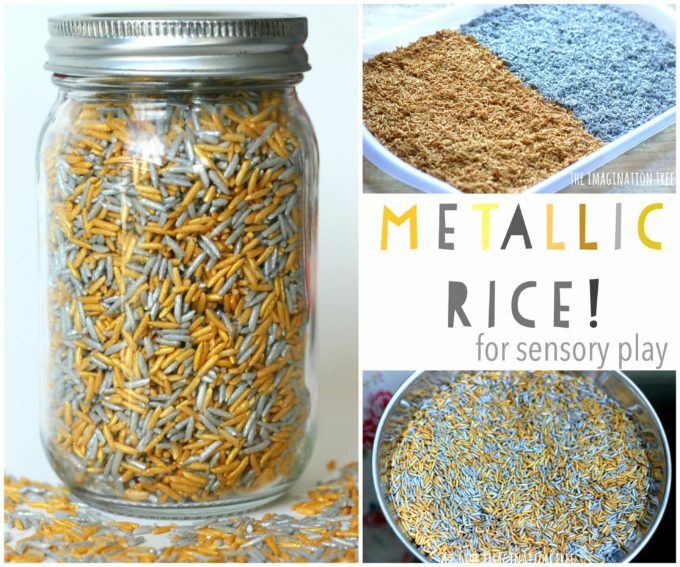 Click to see our extensive collection of sensory rice recipes on the blog. 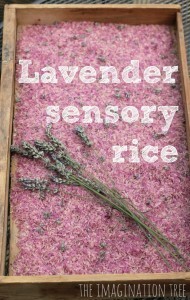 We have everything from naturally scented herbal rice to vibrant rainbows, lavender and apple cinnamon! And our SENSORY PLAY IDEAS archives is bursting at the seams too! Be inspired.